Double Feature Digs are Mutant Epoch rpg side quests and adventures that can be played in a sitting or as a complete mini convention style set. These are very well written adventures that develve into the darker heart of the Mutant Epoch wastelands. The artwork and writing are up to the usual Outlander arts standards and the full old school vibe is in effect with the PC's drawn into the plots and machinations of the NPC's behind the adventures, these two adventures can be linked into Pitford or one of the other locations within the Mutant Epoch World. Though I've always loved the Mutant Epoch material, at the moment I don't have a group of players who are into this level of gritty comic book old school style play. Which is way too bad because these two adventures are very,very, well done. Beneath The Spire is a perfect gateway for a party with a robotic or cybernetic PC. The plot pulls these characters deep into the wasteland backdrop of the adventure location. Here's how these two back to back products break down. Beneath the Spire is best suited to character parties with one or two cyborgs, and involves the investigation of a mysterious tower in the wastes, as well as the soothing promises to those of flesh and chrome, bone and steel. This adventure includes a full page map and new robotic nightmare to challenge your players. Tunnels & Skulls involves an assortment of adventure hooks, a random sewer tunnel generator, two grid sheets for your own sewer network maps, a random encounter table, d100 treasure table plus an all new creature (pictured on the cover). Tunnels and Skulls is a very interesting variation on the classic post apocalyptic sewer crawl, a classic bit of old school adventuring that gets used to great effect in this adventure. On the whole this is a really nice set of adventures to challenge a party of Mutant Epoch adventurers and with the introduction of the new menace to the game this is a solid way to get some of the newer material injected into your Mutant Epoch campaign as a side adventure and that's where I have a problem. 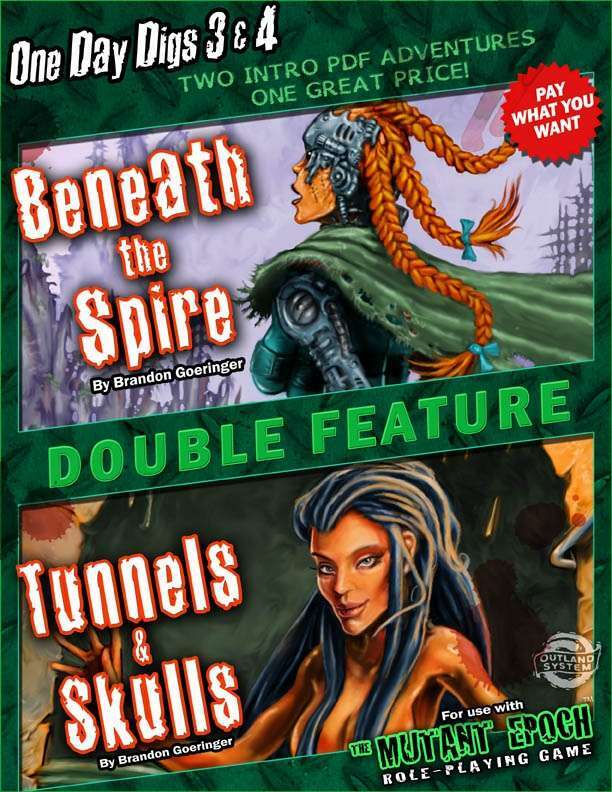 The second adventure Tunnels and Skulls could be used as a perfect introduction adventure encounter. The adventure includes two elements that could be expanded into a full service adventure all by itself. See the adventure hooks, a random sewer tunnel generator, two grid sheets for your own sewer network maps, a random encounter table, d100 treasure table plus an all new creature are the perfect gateway set of variables that can be added into an evening's introduction to connect with the Mutant Epoch campaign setting Pitford. 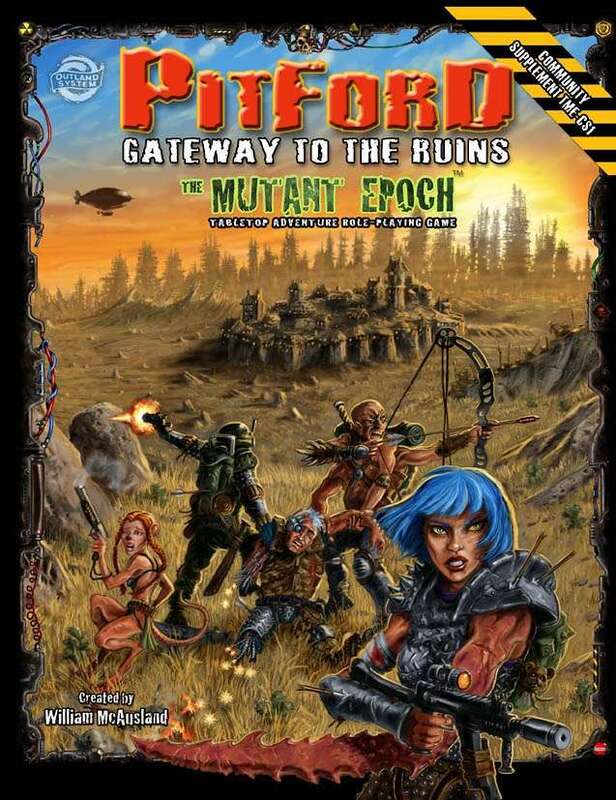 In point of fact Tunnels and Skulls can be back connected into the Pitford setting to get the PC's deep into the whole old school Mutant Epoch local. With Tunnels and Skulls the drop in effect of the adventure allows a DM to drop the whole menu into a campaign as an introduction to the city.This is where the PC's become the heroes and can stream line this whole package into the world of Pitford with the second adventure then being used as a gateway to even more of the goings on of that city. Bottom line is One Day Digs 3 and 4 Double Feature worth your Mutant Epoch dollars? Yes I think so. The plot, artwork, maps, random tables, and more are perfect fodder not only for Mutant Epoch but any number of old school post apocalpyptic campaigns and retroclone systems. A four out of five for this one.